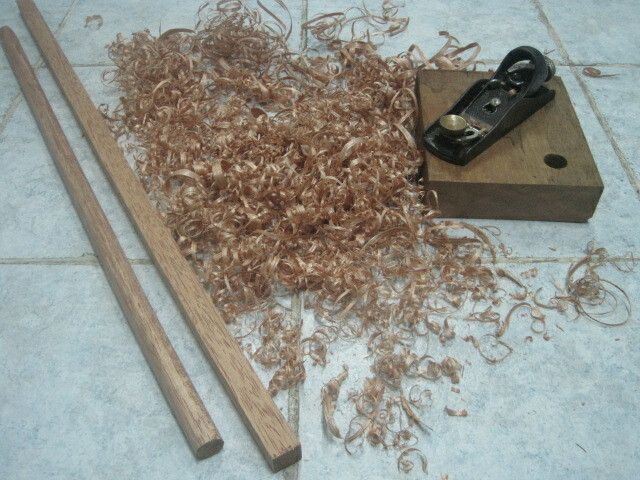 I’ll second that—it is fun to make dowels with a plane. The other benefit to making them this way is that the corners on the tiny facets dig into the round holes as they’re driven in. So they are grabbier than a perfectly round dowel. I recently made some rather long dowels with my dowel plate–around 4″. If you take it slowly and tap lightly, the wood won’t split. I was using cherry, though, so I’m not so sure that a brittle wood like purpleheart would hold up. Yes, I can vouch for the “grabbiness” of these dowels. I basically worked it until I could run the dowel all the way through my test hole, although it took a little twisting and pulling in places. That’s a good thing. Yeah, hadn’t considered the length issue. Makes sense — they’d probably get a bit of a curve to them, the longer they are. That said: although I haven’t tried it myself, I can see you enjoying some sort of pole or treadle lathe. Yeah, I could see a pole lathe in my future. No plans, but it sounds like something I would consider if I had the space (although I think I saw a plan once that incorporated the workbench). Thanks for sharing Eric. Looks like a very handy technique. And as the others have said you don’t need it perfectly round and probably better if it’s a little uneven to hold in the hole. Recently I used the dowel plate technique with some good success http://theloveofwood.blogspot.com/2010/07/square-peg-in-round-hole-aka-making.html. Combining the two techniques could be another good way. Excellent! Thanks for sharing that link, Dan. For my bench, I can put up with the unevenness of the handplane method. But if I was doing something that required a better show quality, I will certainly use the dowel plate technique!